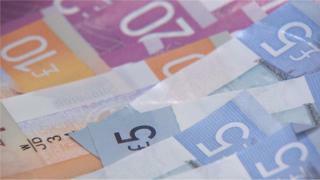 An MP has lodged a bill at Westminster calling for Scottish banknotes to be accepted throughout the UK. Scottish banknotes are legal currency throughout the UK, but technically do not qualify as "legal tender". Lib Dem Alistair Carmichael said that "every Scot who travels south has a story about their money being turned down or looked at sceptically". He wants to change the law to "oblige businesses and companies to accept Scottish banknotes as payment". The move comes after tennis coach Judy Murray tweeted about a Scottish note being refused at a London bakery. There are strict rules governing what is "legal tender" - a phrase which has a narrow technical definition in relation to the settlement of a debt, and which the Bank of England says "has very little practical application" in everyday transactions. No banknotes are classed as legal tender in Scotland, while notes issued by Scottish banks are legal currency but not legal tender south of the border. Mr Carmichael's Legal Tender (Scottish Banknotes) Bill would stress that no distinction could be drawn between Scottish banknotes and those from other banks as forms of payment. The former Scottish Secretary said: "There is no reason to make a distinction between Scottish and other banknotes as acceptable payment. It's beyond time we give legal force to the well-known phrase 'that's legal tender, pal'. A similar bill was put forward by current Scottish Secretary David Mundell when he was an opposition MP in 2009. His Scottish Banknotes (Acceptability in United Kingdom) Bill had a first reading in the Commons, but made no further progress and never became law.